DC Mayor Teams Up With Justin Timberlake In Promo Clip For Washington's Anti-Gun March [VIDEO] - Joe.My.God. 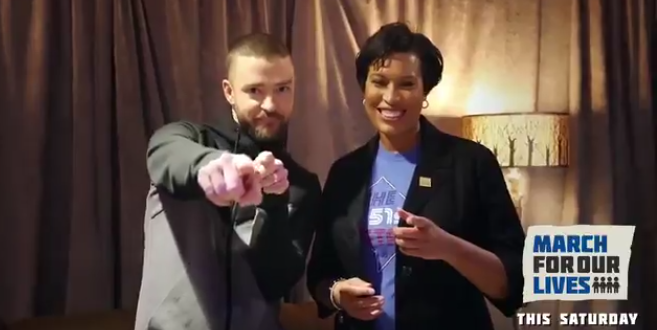 D.C. Mayor Muriel Bowser and singer Justin Timberlake teamed up to welcome the thousands of protesters who are expected to descend on the District for the “March for Our Lives” rally Saturday. “As mayor of Washington, D.C., I’m pleased to welcome students and families supporting the ‘March for our Lives’ this Saturday,” Bowser says in a video posted on Timberlake’s Instagram page. Bowser and Timberlake also urged people to get involved and join the march. Washington Mayor Muriel Bowser on Tuesday rolled out the district’s plans for the upcoming March for Our Lives, unveiling a sweeping set of preparations, including Metro closures and restricted access to President Trump’s D.C. hotel. D.C. residents and visitors can expect the Federal Triangle Metro station to be closed for the duration of the march, as well as limited access to the Judiciary Square station. At the same time, Washingtonians will also be hit by street closures during the march, including sections of the centrally located Pennsylvania and Constitution Avenues. As I noted in today’s post about the coming nor’easter, air and rail travel might still be a mess by the weekend, so plan accordingly.